The tenth Writeidea Festival, Tower Hamlets Council’s unique free reading festival, will take place at Idea Store Whitechapel over the weekend of 16 - 18 November 2018. You won't want to miss Michael Rosen, Viv Albertine, Chris Difford, co-founder of Squeeze, Suresh Singh and The Gentle Author. Once again the team at Tower Hamlets Local History Library & Archives have curated their own mini programme and will be hosting a stall (on the Saturday only). 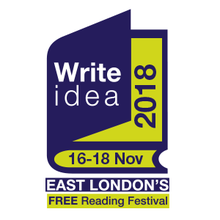 Speakers include: Muhammad Khan, Melanie McGrath, Helen Croydon, Philippa Stockley, Frances Hardinge, Edin Suljic, John Broughton, Kate Young, Diana Evans, Savita Kalhan, Jay Bernard, Storytelling with Embers, Dina Begum, Garth Cartwright, Melanie Whitman, David Stubbs, Leslie Clayden, Charlie Kiss, Neil Faulkner, C.G. Menon, Allan Jones , Simon Miller, Diane Atkinson, Simon Hannah, Eric Levene, Storytelling with TUUP.